SANTIAGO, Chile, February 6, 2017 (ENS) – In Chile’s worst fire disaster in 50 years, the South American country has lost over half a million hectares to more than 100 wildfires that first flared up in mid-January. The blazes have frustrated firefighters’ efforts to control them, with new hot spots emerging daily across the central and southern regions. Eleven fatalities have been reported, many of them firefighters. Meteorologists say the entire Southern Hemisphere is experiencing an unusually dry, windy summer, ideal conditions for wildfires to burn out of control. 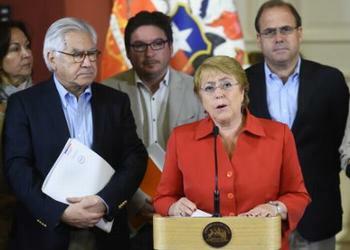 Chilean President Michelle Bachelet has declared a national state of emergency. As of today, 26 fires are more or less under control, but at least six wildfires are still raging, according to the Forestry Operations Center, CONAF. Cristian Orellana, who manages CONAF in the central Chilean region of Maule has been supervising the response to the largest fire in the country. “In a single night, the fire spread over 10,000 hectares, covering 26 kilometers,” he said. “The heat was such that even planes couldn’t fly over to drop water,” said Orellana. The fire wiped out the entire town of Santa Olga, former home to 4,500 inhabitants. 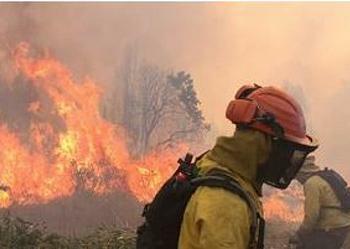 The fires can reach extreme temperatures, sparking devastating fire-storms spread by strong winds. blazes. Trees are blown off their roots and the fires carbonize everything in their path, leaving only white ash scattered across the hills. Entire vineyards in Chile’s famous wine region have been destroyed. Thousands of people have had to flee their homes, and over 1,500 houses have been completely destroyed. Families are gathered in makeshift camps, where the Chilean Army has set up tents to shelter those who have lost everything. Sergio Galilea, Undersecretary of Public Works, will manage reconstruction in the regions of O’Higgins, Maule and Biobío, the president said. “He must be on the ground, together with the people, listening to their needs, supporting their efforts, mobilizing and streamlining public services within agreed and limited deadlines, because our compatriots can not wait,” said Bachelet. The European Union is offering assistance through its Directorate-General for European Civil Protection and Humanitarian Aid Operations. Established in 2001, the EU Civil Protection Mechanism, EUCPM, coordinates national civil protection authorities across Europe to deliver immediate assistance in the aftermath of a disaster. “I have never seen such widespread damage and such a level of destruction,” says José Almovodovar, an EUCPM expert in forest fires, after viewing the region from a helicopter. In the last few days, 52 firefighters from Portugal deployed under the EUCPM, have brought some of worst fires under control. “We have rarely witnessed such extreme behaviors in wildfires,” says Miguel Cruz, the deputy head of Portugal’s Protecçao Civil and a veteran of EU Civil Protection deployments in Latin America. Wild animals are fleeing the forests towards inhabited areas in search of food and shelter, says CODEFF, the BirdLife International affiliate in Chile, which has mobilized volunteers to help them. Some of the areas affected by the wildfires have been assessed as being Important Bird and Biodiversity Areas by BirdLife International. 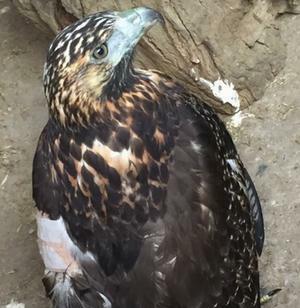 Wildlife rehabilitation centers across the country are treating birds, snakes and mammals such as foxes, leopards and cougars. CODEFF is running a campaign to collect medicines and medical supplies for the treatment of burned animals. Safety equipment is also welcome, as it is used for volunteers, helmets, filter masks, leather gloves and safety shoes are needed. CODEFF is coordinating with various government agencies and other NGOs to go to the most remote areas in search of injured animals. The fires can be seen from space, and their pattern includes a massive burn scar near Empedrado. Scientists with the U.S. National Aeronautics and Space Administration, NASA say this year’s Chilean fires are 10 times more numerous that those recorded during the dry seasons from 2003 to 2016.